My newest pattern is off the hook, through the washing machine (more about this in a sec), and back from my awesome testers!! Introducing It's Stashing Tote! Say it fast. Yes. It sounds like It's Dashing! And it is!!! As you might have noticed from the name Felted Button that I love felt and buttons. This beauty has both!! Oh, and oodles of color. One of my testers did it in black, grey and soft blue. Lots of options, I tell ya! Admittedly, I have a disease. It's called "compulsive containerism" and I've got it bad. I love bags. On a trip to Taiwan for 10 days, I came home with 11 bags. Just call me "The Bag Lady". Now, if you look at this and think, "Wow, I would like to make that, but I have never worked with wool and felting." FEAR NOT! In the pattern I walk you through the steps of felting--which can easily be done in your washing machine. The results, a sturdy, strong and durable bag which will last! If you've got lots to take with you and need room for expansion, just unbutton the tabs and you've got it--showing some little dottie happiness! The pattern gives all the information on yarns, how to put the bag together, and how to felt it. You can find the pattern in my Craftsy shop, Ravelry shop, and Etsy shop. 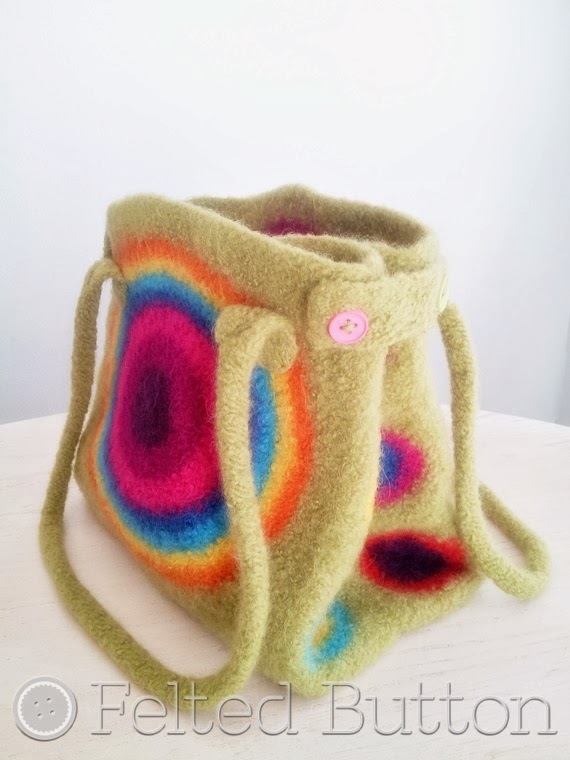 If you want to keep in the Felted "Button Loop" follow me on Facebook. 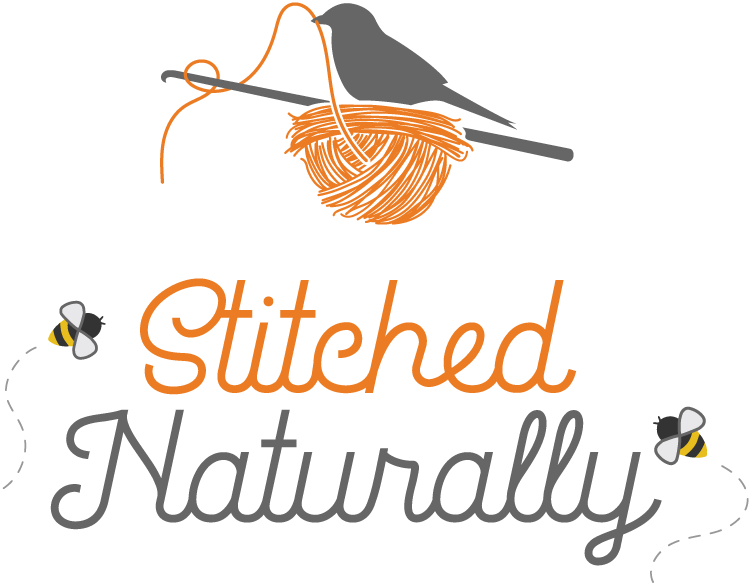 Lots of color, crochet, yarny business and positive--come say hello! | On the Board | -- BLOOM with courage and grace. This is gorgeous! I am so happy I got to test the pattern--it's incredibly thorough and simple to make!! Anyone can do it!! Thank you for such a wonderful tote!!! Thanks so much!! I really appreciate your feedback and help with this! You are a trusted tester! Thank you so much! You are very kind! This is so eye-catching! 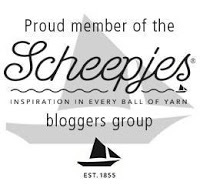 So glad I found your blog via Moogly's link-up. :-) Your designs are so wonderfully colorful. Thank you so much! I really am a bit color-crazed! It makes me happy! Thanks a bunch, Corina! That means a lot coming from you! Hi, this bag is beautiful. I've just started felting my crochet and have been looking for inspiration. Do you think your pattern would work with 8ply wool ? I'm in Australia and it's hard to get 10ply. Thanks. I think it would be fine, but your bag would end up a tad smaller. Thanks, that what I thought. Can't wait to download pattern and get started now.